American Kids Try Vietnamese Food & Risk Tasting Sriracha Too! 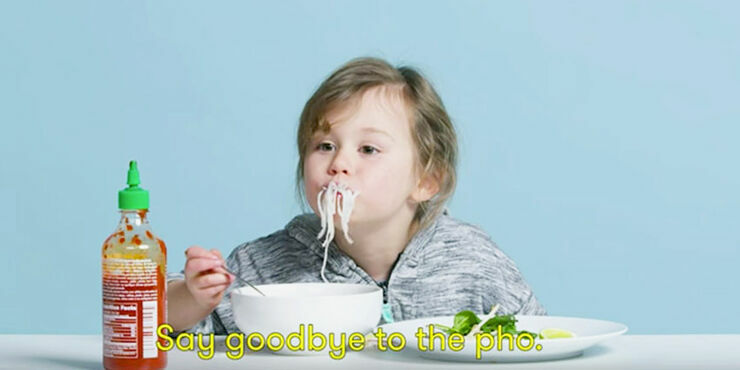 These Kids Try Vietnamese Food For the First Time, Struggle With The Names—And The Hot Sauce! Vietnamese Food is cheap and filling as well as bursting with fantastic flavors centered around a vegetable base, so it's pretty healthy. It's also been gaining in popularity with people in the US recently with an upsurge of Vietnamese restaurants and Vietnamese street food. But do American kids like it? And have they aver tried it? So it's always good and encouraging when kids try cuisines from across the world, food that isn't just a McDonald's located in Paris. In fact there's a whole series of videos called "Kids Try" from HiHo Kids (an off shoot of Cut Video), where children taste a variety of different global munch to see how they get on with it. In this video above they're getting their chops around various courses of Vietnamese food recipes including pho, bánh xéo, and cá kho. From taking in the smells (which get mixed reactions) to delving into some catfish. These culinary critics are nothing if not enthusiastic about the various Vietnamese food dishes they try. Sure they might make the "Eww, yucky" remarks that are typical of kids when eating most things that aren't ice cream or chocolate, but they persevere, even when they think they are eating cat (it's actually catfish). Perhaps the funniest (and cruelest) part is when they get the kids to try some Sriracha hot sauce (a favorite addition to lots of Vietnamese food dishes) squeezed into their bowl of pho. You have to admire them, trying new food as a kid can be a big challenge for kids, but adding hot sauce to what is already a strange Vietnamese food dish is demonstrating their food tasting bravery. One poor kid also finds out the hard way what it's like to eat too much. But they survive, and it's on to the next course. These kids are too cute and funny. It's a valiant effort all round really. If you enjoyed seeing the kids try traditional Vietnamese food, it's not the first time these American children have been filmed venturing into unfamiliar culinary territory for your entertainment. Many of the same young 'uns, and many different ones, have tried a range of other foods in previous videos from the series. It's hilarious. You can check some of them of our favorites, below. The feast of food before them this time consists of shrimp, grits, gumbo, king cake, chicken and waffles. And they seem to love it, especially the chicken and waffles. This time the cute kidsters from Seattle tuck into some Ethiopian dishes including kita fir-fir, injera, and himbasha bread. Some of their reactions are hilarious. Popular food from China is on the menu this time, with dim sum, zongzi, jellyfish salad, and BBQ pork tickling the kids' taste buds. How will the kids get on taste testing popular meals from the Philippines? Meals that include liver, pig's blood, and a delicacy known as balut, which is an 18-day-old fertilized and then boiled duck egg. In this one the kids try molletes and one of them thinks it's a dinosaur. Which is a brilliant comparison to make. Get that kid a restaurant review column now.